2012 France Silver 10 euro Dragon Proof Coin NGC PF69. The coin weight 20.2g and 37mm in Diameter and contains 99.9% Silver. Its limited issue of 10,000pcs only. Its Certify Proof PF69 Unltra Cameo by NGC (a prestige grading company). Makes a great gift, especially for those who are born on the dragon years on the Lunar calendar. Year 2012 is a Dragon year. The Dragon is the ultimate symbol of the wisdom and culture of the chinese nation. For thousands of years it has represented the people's spirit for advancement and their desire to express themselves through the beauty of life. The dragon is seen as the incarnation of power and authority, it can change its shape, swim the deepest seas and fly to the heavens. Of all the Chinese symbols, it is regarded as the most important , commanding heavenly dignity and is often depicted among the clouds The Dragon Throughout history, in virtually every part of the world, mans imagination has been fueled by the magic and majesty of dragons. These strict guardians have protected buried treasure, golden fleece, even immortality. In China, the dragon has prevailed as the trusted custodian of the highest fonn of wisdom the pearl. As a supernatural power, the dragon became the symbol reserved strictly for the Emperor. Those who chose to embroider a dragon upon their clothing dared to equate themselves with the Emperor and did so at their own peril. Dragon and Emperor were one. The dragons pearl, believed to reside in the dragons throat, represented the indisputable authority of the Emperors words. At the dawn of a new millennium, "The Year of the Dragon" brings with it the promise of prosperity. 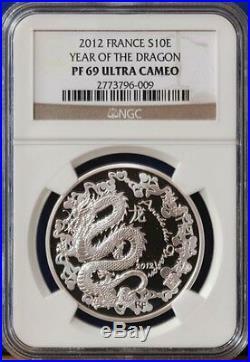 The item "2012 France Silver 10 euro Dragon Proof Coin NGC PF69" is in sale since Thursday, April 25, 2013. This item is in the category "Coins & Paper Money\Coins\ World\Europe\France". The seller is "jon_sold_it" and is located in Fresh Meadows, New York. This item can be shipped worldwide.